Porsche has its own ideas, but if you ask us, an all-wheel-drive 911 on steroids would look a lot like a BMW X6. An X6 M, to be precise. When the first generation of this slant-backed beast arrived five years ago alongside its platform-mate, the X5 M, the duo marked departures from several formerly sacred principles of BMW's M GmbH. These Ms were not only SUVs, they used a torque-converter automatic, all-wheel drive, and a turbo. Earlier prohibitions against these attributes were swept aside because, well, the M division resides in the peaceful village of Garching, just north of Munich and within shouting distance of BMW's headquarters. And on the upper floors of that four-cylinder-shaped building, the execs like numbers on the balance sheet: Big, fat, black numbers. Nonsensical as it seemed to outside observers, the X6 M became wildly popular with customers. Imposing, loud, and fast, it was about as politically correct as a Hummer H2 and less useful. But it was fun to drive. Now it is back. Based on the just-launched second-generation X6, it has become a better car in virtually every respect. Just look at its heart: The 4.4-liter twin-turbo V-8 gets a boost to 567 horsepower and a whopping 553 lb-ft of torque, up 12 hp and 53 lb-ft. It also gets a new eight-speed automatic transmission and launch control. The numbers are great, as expected: BMW says zero to 60 mph takes a mere four seconds flat, top speed is governed at an entirely sufficient 155 mph. What customers may appreciate more often is the 20-percent improvement in fuel economy, at least as measured in the European cycle. If mirrored in U.S.-market EPA tests, the combined rating could rise from today’s 15 to as high as 18 mpg, a figure that won't win any more respect at your natural foods co-op. Still, it's nice to go farther on a tank of fuel, no? 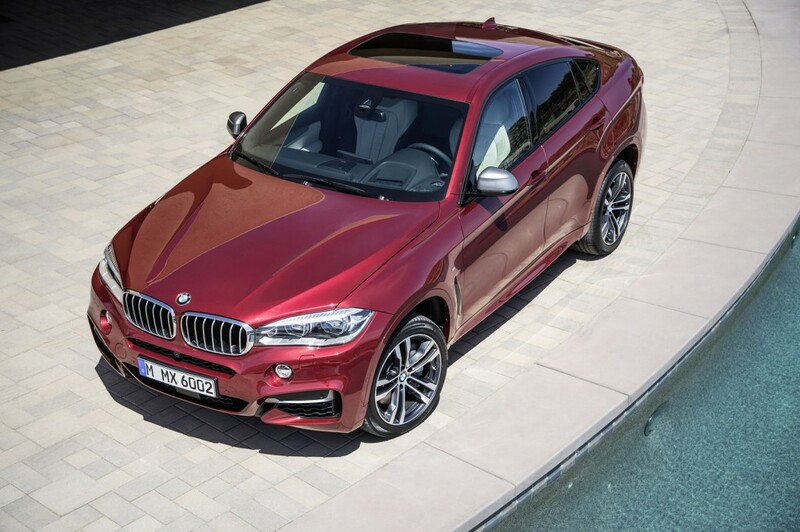 X6 M buyers—and those of the new X5M, which debuts at the same time—may also notice the sound. “The exhaust system has been modified to satisfy the sporting ambitions of the new M models,” says BMW, as if the previous model’s exhaust note were somehow insufficiently loud. The skillful engineers of M GmbH have modified the chassis extensively to match this X6's awesome power. The front control-arm suspension and the independent rear suspension have been stiffened and lowered to allow higher cornering speeds. Standard 21-inch wheels wear 285/35 front and 325/30 rear rubber. A high-performance braking system is in charge of stopping about 5000 pounds of metal in the shortest possible distance. Judging from our impressive experience with a regular V-8–powered X6, the M model must be a stunning performer on twisty roads and even on the racetrack. Inside, the X6 M comes with uplevel appointments and plenty of "M" cues. These include specific instrumentation, sportier seats, and customization features offered only on the M models. And outside? The changes are extremely successful at expressing successful extremity. From the large, functional air intakes to the “air-breather” vents aft of the front wheels, the vertical rear reflectors, and those four exhaust pipes you can't miss, the X6 M is probably the most impressive and cleanest-looking X6 of all. It's yours for $103,050. And until Mercedes-AMG or Porsche comes up with its own coupe-like SUV variant, the X6 M remains in a class of one.